FosPower premium 2 RCA male to 1 RCA male Y audio cable adapter allows you to connect your home and pro-audio equipment with ease, such as a subwoofer. This RCA adapter can be used to split a mono source into 2 signals or combine a stereo source into a mono signal. Use this cable to connect a mono audio source to stereo audio equipment with RCA connectors. 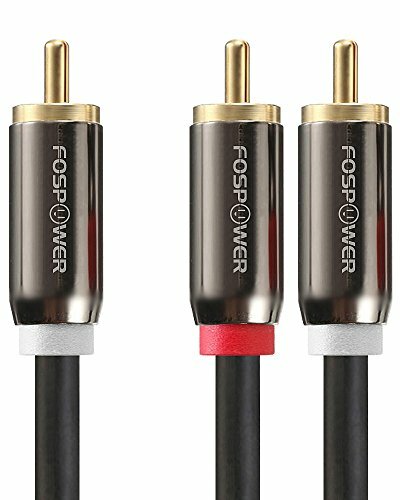 FosPower premium stereo audio cables are made from high quality 24k gold-plated connectors that resist corrosion and reduce tarnish to ensure the highest quality audio connection. Color coded connectors to distinguish polarities. FosPower stereo audio cables dual layer shields are braided with copper and protected by aluminum foil, which provides cable flexibility and greatly reduces unwanted EMI/RFI interference. The tin plated copper core of the FosPower stereo audio cables reduces oxidation and increases the cable's life. If you have any questions about this product by FosPower, contact us by completing and submitting the form below. If you are looking for a specif part number, please include it with your message.